Castles in minecraft do not naturally spawn. It is a shame, because castles are iconic in minecraft, despite only existing when built by players. 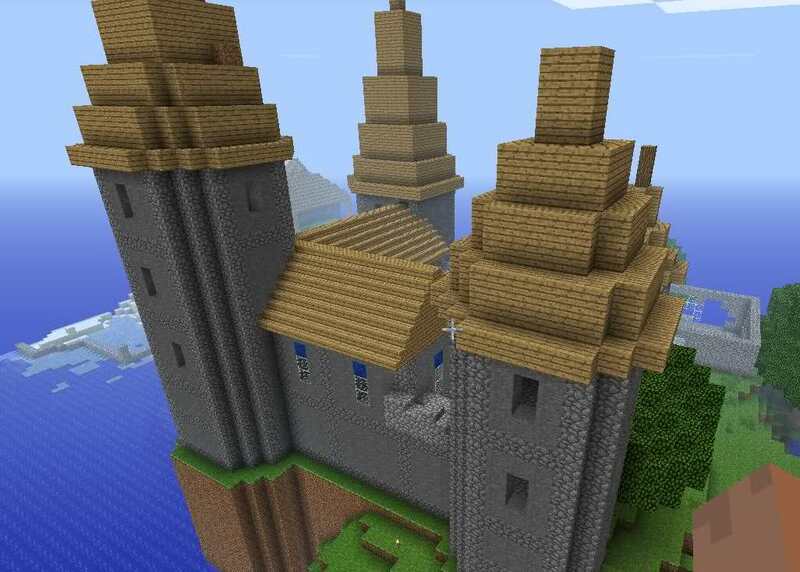 Castles make the minecraft world more satisfying. I am not saying players shouldn't build castles, but simple, game generated castles would be exciting, and inspire the players to build their own. There are many benefits to castles. There is enough adventure underground in minecraft, but there is not enough adventure adventure overground. villages, and temples are nice, but there are stil dull areas in the game. allowing castles to spawn in plains, and hills, extreme hills, and the like, would add to the adventure. It would look especially nice having castles nearby villages. Castles would not only look nice, but would benefit gameplay, castles could have a chance of having a treasury, or dungeon, creating oppurtunities for finding valuables. Players could also take possesion of the castle as a base. Castles can be found in most grassy biomes. These include hills, plains, and the like(variants with different trees included), and exclude desserts, biomes with snow, jungles, swamps, and similarily ungreen biomes. They are about as rare as villages, but the chance for generating might need to be adjusted do to villages requiring relatively flat land, while castles will not require it as much. There are a couple different possibilities for the design. 1. design could be similar to desert temples in which pre designed shapes are put together forming various castles. The height would work well at about 15 blocks high(highest point). 2. castle could generate rooms, and towers, and then connect them with floors and walls in a simalar way to village roads, adjusting to the shape of the terrain. Treasury - blocks of gold, iron, emerald, or lapis lazuli + chests with ingots and the like, + armor and other valuables. Taking into acount some feedback I have revised the plan. The size should be about the size of a dessert temple. The design should be simple, with a couple floors, perhaps an open space in the middle and towers. The walls will have battlements of course. the design could be set in stone, but it would be more interesting to have some variety eg. a different number of towers, and/or rooms(simple and small rooms). The Castle should be built out of stone brick and perhaps some cracked or mossy ones here and there, but I can see it being built out of cobblestone. That is everything. I hope you like this idea. And If it was Console Exclusive that would be fun. Slytherin is greener than Ravenclaw. It's an interesting idea, but I don't believe such a feature is suitable for survival minecraft because such a structure provides too many pre-built features. Basically what I'm saying is that, why would I bother building a house if I have a ready made one here that is quite secure and has all the rooms I could ever want. Nevertheless I don't believe this is a bad idea, but if definitely needs to be scaled back. So to build off your idea a bit, I would recommend a structure that resembles a dinning hall that spawns with villages, and is made of cobblestone with a wooden roof. It would make sense as the villagers should have a place to wine and dine, and you can have the a throne type chair at the head of the table as well. There could also be a few chests in there that provide some food. The issue with your idea is that many people are simply lazy and will move into the villager homes or merely build a basic structure because they can't build. So basically this just provides them with a decent sized base without having to do any work. and I found a good example of the kind of thing I was imagining. The attached image is a nice example of what the castle could look like and its about the right size. However, the castle would NOT have wooden roofing. It would have a platform and battlements at the edges. This applies to the tower as well. the castle can be made of stone brick, stone, cobblestone, or a combination. I like stone brick, but cobblestone is more commonly used. This is slightly opinion based, and I wouldn't mind some different ideas regarding the castle. But (in my opinion of course) it should be a castle, in the middle of nowhere. Ok, about the lazy people. The castle being as rare as villages, and about the size of this picture, it would be more difficult to find. Instead of rooms, It could just have hallways and towers, with a couple of chests. this would make it no different a shelter than villages, accept in the event of a village seige. But yes. Now that I think about it, simple castles sound more pleasant than complicated, furnished castles, with out a soul in them. The desert and jungle temples are both somewhat alike. They both have a preset design, fairly simple, and a trap of some sorts. Lets scale the "castle" down to the same level. make it a simoke Keep. Just a single square shaped base, that has two floors. Each floor is effectivly its own "room". Don't put any of the fancy stuff in there though. Have the treasure somewhere on the second floor, and some sort of redstone trap or puzzle. Maybe even add a basement dungeon type deal. Oh and as a bonus to it being this way, you could always decide to build more upon it later. As you can see in the other replies, yes I think it should be small and simple, but what would be nice, is if the castles were not exactly the same shape/design. How about the castle is in ruins? The outer battlements are in rough shape but you can still see the outline of its former self. The inner keep is in better order, but has caved in, etc. Further exploration may expose an inner treasure room or catacombs. Players may choose to fix the castle up and restore it to its former glory or just demolish it or whatever. Just a thought. I like what others have said above. While this may give players a head start toward a home/fortress, a lot of building is still needed. I don't think a castle should be added to the generated structures list. It doesn't add anything to the game. And as someone else mentioned you could just build your own. Quote from DeskepticonI don't think a castle should be added to the generated structures list. It doesn't add anything to the game. And as someone else mentioned you could just build your own. The castle would only change gameplay about as much as the temples do, but it would add asthetic qualitiies. I also would like to see some console exclusive features, and something like this would be uniqe for the console to have. I agree with Deskepticon, therefore i'm sorry to say, no support. Thank you for all of the feedback so far! Just play on in the tutorial world after finishing (or short-circuiting) the tutorial or build your own or go for one of the pre-built worlds available with the different mashup packs. The game seed generator has enough trouble generating villages that aren't messed up, strongholds that are ruined by intersecting by ravines and nether fortresses that don't run off the edge of the nether. I'd honestly hate to see how it would mess up a castle... particularly in an extreme hills biome and particularly in the 360-sized world. I'm betting it would be be more of an eyesore than anything useful. Remember, this castle isn't very large, so there would be room for it. And the extreme hills biome does not need to be included in the biomes it can spawn in. Its about the size of a dessert temple, which isn't particularily big, and I also have never seen any issues with dessert or jungle temples. If you are referring to the glitchy village with the top haves of buildings messed up, that was a generation bug that was fixed. Nope, I'm not talking about that specific glitch, but villages where two houses get joined together or situated half into hills such that the drop from the door is a "watch that first step, it's a doozie" event or with doors half buried in the sand, or where the walkways have fallen into a ravine cutting under the village. I HAVE seen both jungle temples and desert temples with the same sort of situational problems with the surrounding terrain (e.g a desert temple that intersected a village house). IMO, adding castles would just add to the player having to "fix up" (or destroy) a poorly generated structure. It's probably quicker to just build your own (particularly if you keep it small and of a simple design). Oh, and do we really need more chests to loot? Personally, I don't think so. Also, people are already speculating that the numbers of biomes are getting so large that, in order to get every biome into a world, the biome size will have to be really small. Do we really need to be trying to cram in more structures as well? It's not a problem for the people, like me, who like single-biome worlds and don't mind doing without this bit of loot and that bit of loot... but I think people like me are in the minority. Most people seem to want their seeds to have absolutely everything in them the game can possibly offer... so, if biome crowding is a problem for them., structure crowding would also pose a similar issue. As for your underground vs. above ground comparison. Underground currently generates 3 sorts of structures - stronghold, abandoned mineshafts, and dungeons. Above ground currently generates 4... desert temple, juingle temple, villages, and witch huts. However, we certainly don't want more structures underground since that would "eat up" space occupied by valuable ores. What I'm saying is we don't want more structures above ground either since build space (particularly in the flatter areas of the map) is also valuable... and rather limited in an Xbox 360 world. I like the idea of a small ruined castle, with maybe a treasure chest with some great loot. Restrict it to one or two biome types to keep it simple. My favorite part of the game is going in and fixing villages and making them livable. Doing the same to a castle would be fun. My wife built a creative map for me once with a similar idea. She built a small castle under a cliff and I tripled its size. I could see something similar here. Again, as long as it's about the same size and complexity as a temple, it should be possible. This is why I suggested using the various MashUp pack worlds. Fixing villages used to be fun... but doing it over and over again in each new world gets to be a drag... still I feel compelled to do it since they are such eyesores if just left the way they generate. That takes time and resources away from progressing my own ideas. If, rather than 1 elaborate world with a mashup pack, they did a set of worlds with smaller thematic pre-builds in them; those worlds could be used to satisfy those who like to basically just hunt the map for treasure and enlarge upon existing builds rather than create their own from scratch... and each mashup would present a different "expansion" challege rather than just the same ol same ol chores that, right now, each new world generated presents (i.e. either tearing down or repairing a ruined village) and raiding a meager amount of gold and bones out of a desert temple, etc. The changed tutorial world with each feature adding update can also be used by players in this way... that's why the 12 hidden chests have been so popular in the past. However, a lot of people don't realize that it is perfectly possible to continue playing in Survival mode in the tutorial world long after the tutorial itself has finished (even changing the difficulty setting). Extreme Hills biomes can get pretty, well... extreme. I've seen village houses spawn just on the edge of ravines or caves where the "basement" is several stories tall. This will probably happen almost every time a castle tries to spawn in EH biomes, making it all look really ugly. But to my point, I don't care about adding some arbitrary aesthetic to the game with pre-generated structures... I do all that on my own when I build. If you said the castle contained a new building material exclusive to consoles, or if they housed a new MOB boss, etc. then we're having a conversation. But a square slab of stone with some crappy loot...? No thanks. I would like it better if the castle were constructed of mossy cobblestone, as you mentioned in your op. We can always use another source of it, since we can't craft it. I'm saving it for a large construction, and after pillaging around 15 dungeons and swapping out the mossy for regular cobble in my jungle temple, I only have a little over a chest of it. I wonder what the max is... Anyone out there a collector of it and want to share how much you've found?